Traveller5 has been updated. Almost two years after I got it. Now it is Traveller v5.09. It is almost a 100 pages longer. Lots of mistakes have been corrected. Examples and an index has been added. This makes it a lot better than before. From what I understand, there will be a version 5.1. That is good since there are still a few problems in this (5.09) version. Hydrographics in world-building is one (that I think is very important) and problems with the index is another. All backers of the Kickstarter project and everyone who has bought it will get a coupon so they can pick it up for free at DriveThruRPG. There is a new Traveller Die Roll Maker for Traveller5 for both iPhone and iPad and in the Mac App Store. Welcome to the Zhodani Base Awards 2013! 2013 has been a very good year for Traveller. 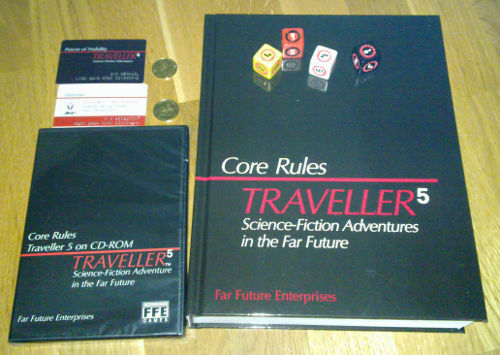 There have been lots of new publications including the Traveller5 book we had been waiting for. There were lots of Traveller products with nice covers this year. Lots of love for all nice covers. The cover for Freelance Traveller Issue 037 by Shawn Driscoll is one of the best covers for Traveller I’ve seen. I’ve been wondering for almost a year now if another cover was going to beat it. No, I still think it is the best one. I am also impressed by the new fanzine for 2300 AD, Colonial Times. There were lots of fine Traveller Adventures for different settings published. The one I liked best was an interesting adventure for 2300 AD. This is a good adventure for an interesting setting. This winner makes me want to play 2300 AD again. There was lots of fine ships for Traveller published this year. Vulkan was the most impressive ship module with adventures as well. It made me think of Space: Above and Beyond. There was lots of interesting stuff for ATU published this year. Clement Sector won because it is really cool. The other nominees are also very good. If I didn’t already owned the Judge Dredd RPG rules from Games Workshop I would be more interested in buying the Judge Dredd modules from Mongoose. T5 is the best OTU product. It is a complete new rule-set with lots of new interesting ideas added to the existing OTU. I am well aware that some think that a new rule-set isn’t needed and that these new rules are badly organized. I think that these rules are good enough to start playing Traveller, either if you are new to RPGs or have played for years. 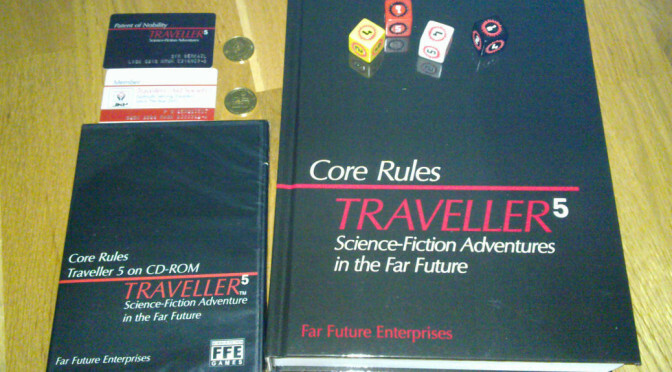 If you already (like me) have seven other sets of Traveller rules, then maybe it is not needed. But I bought it anyway, since I wanted to support the Kickstarter project and I wanted to see the finished product. I am happy with the way it turned out (but some things could have been made even better) and I like the new ideas in the book. I am looking forward to seeing new T5 products. The Farragut-class Wallpaper is pretty and the Through the Veil Part adventure is interesting, but for me the Cargo Barque was the most useful free Traveller product in 2013. In the Traveller5 Book and in the Traveller5 CDROM we can read about a few interesting things that will expand the current “Charted Space” of the OTU to a galactic scale. There are a few hints that we can expect some epic adventures. If we look at the image of The GALAXY (p. 417 or in the CDROM) we can see many interesting things. In the map in the book these are called Scattered Hydrogen Societies. 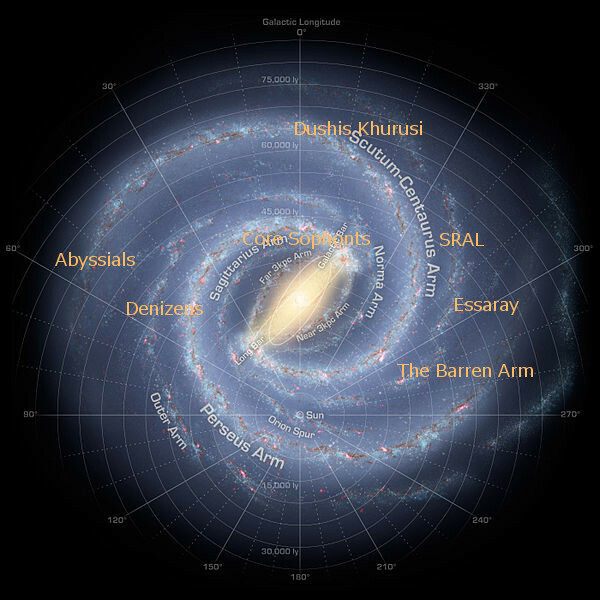 I have added these on the Milky Way map below. Milky Way with information from Traveller5 added. Map from NASA. Public Domain. From the top there is first Dushis Khurisi. Searching the interwebs I found it in Eaglestone’s Vilani Dictionary. The meaning is “poem“. This made me suspect that this was something from The Galaxiad. And there it is! Dashus Khurisi (slightly different spelling) is a Vilani Empire on the other side of the Galaxy. In the Galaxiad Intro, the Abyssals, the Barren Worlds and the Essaray are also mentioned among many other interesting things. But there is no answer to what kind of Scattered Hydrogen Societies the SRAL and Denizens are. There are some notes about the Black Fleets that we remember from the Kickstarter Project (at the $ 25 level and above). The first time I heard about the Barren Worlds was when Clifford Linehan was mapping the Zhodani Core Route. (His site is now offline.) He then discussed this with Marc Miller. That was 13 years ago. Marc must have been planning this a long time. Oh my God, it’s full of Tables! I got Traveller5 from Marc Miller today. I have looked through it. It is huge! The rules seem clearer on some points than in other versions. There are lots of help for both experienced traveller players and for new. But new players may get scared since the book is so huge and some rules are quite complex. The Charted Space that we know is used. I thought the book would have been more generic since I have read about the extended tech-level tables and sophont generation. But I still want to create my own ATU for Traveller5. One thing that I just had to check was the planet creation rules. Was is like Book-3, T4 and T20 or like Book-6, MT and TNE. It’s on page 433. It is like Book-3, T4 and T20, Hydrographics = 2d-7+atmosphere. But in T5 a concept called Flux is used. I am Sir Berkatl of Hrun (Lishun 0312). My TAS membership card is issued on Raoh (Gushemege 3004).